ESPN took to the “green” red carpet with Beyond Zebra, Inc. in tow to unveil this year’s star-studded and, for the first time, carbon neutral ESPYs. To emphasize the ESPYs continued commitment to environmentally friendly productions, the BZI team was challenged to provide greener promotional opportunities than ever before. In addition to the sustainable press credential lanyards and post-consumer recycled tote bags used for deliveries, BZI outfitted the staff with climate neutral shirts produced under the Global Organic Textile Standard (GOTS). These GM-free, 100% certified organic cotton T-shirts were manufactured solely utilizing renewable energy generated from wind power AND are the first garments to be labeled and approved under the Carbon Trust. Beyond Zebra, Inc. was selected by Working Mother Magazine for its April online publication. This special Earth Day edition celebrates visionary Eco-Mompreneurs who have created profitable businesses by combining sustainable policies with family friendly practices. Beyond Zebra, Inc. was recognized as a leader in Brand/Marketing by the Promotional Products Association International (PPAI). 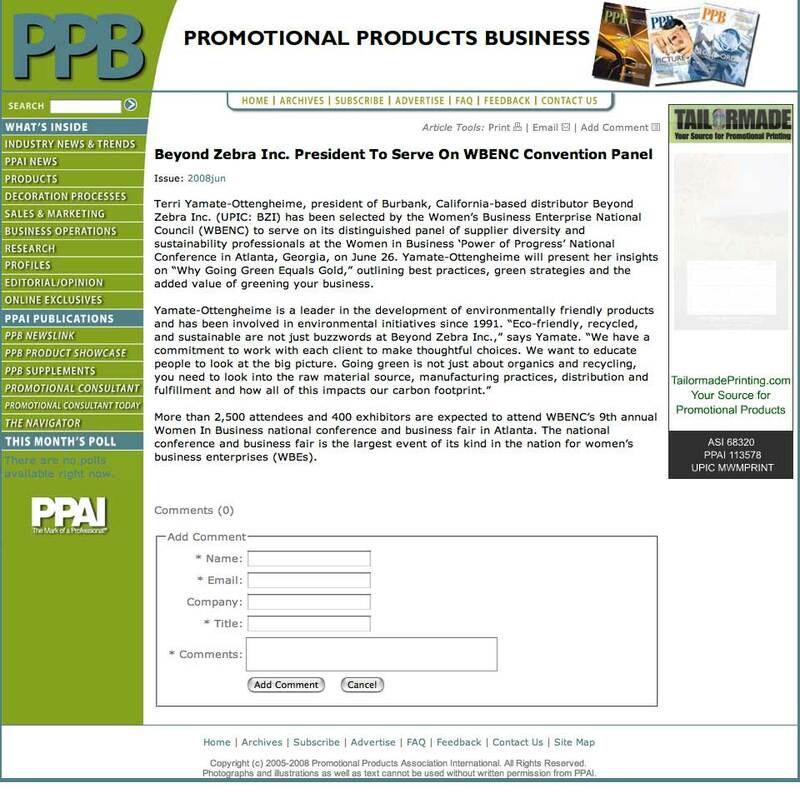 BZI was presented with the prestigious 2009 Silver PPAI Web Award for their innovative and effective marketing and website design at a special ceremony held during the PPAI Expo in Las Vegas, Nevada. PPAI is the preeminent organization and only non-profit trade association for the 19.4 billion dollar promotional products industry. “The winners worked very hard to earn this special recognition and their commitment to excellence is a tribute to our industry,” said Steve Slagle, PPAI president and CEO. This achievement is the latest in a series of accomplishments that has catapulted Beyond Zebra, Inc. to the top of their industry. BZI’s creative culture and distinctive design capabilities have established them as an innovative brand marketing team in the promotional products world. Since the explosion of the eco-friendly movement just a few years ago, the call for green items in the promotional products industry is heard more loudly than ever. Several companies have jumped on the trend and are making names for themselves as organizations with green marketing thumbs. Sure, you’d like to join the crowd—you see the obvious appeal and the potential for success, but how do you get started? Beyond Zebra, Inc. president, Terri Yamate-Ottengheime weighs in on this timely topic. Local newspaper profiles Beyond Zebra, Inc. founders for fulfilling their dreams with style. Stacy Burleson, long-time Santa Clarita resident and her business partner, Terri Yamate-Ottengheime, discuss their approach to business, family and community as women and mothers. Beyond Zebra, Inc. executives, Stacy Burleson and Terri Yamate-Ottengheime, and their families cheered on the East High Wildcats during the World Premiere of “High School Muscial 3: Senior Year” on the evening of October 16, 2008. The pre-release event started with a red and white-themed pep rally, where school spirit T-shirts produced by the Beyond Zebra team were thrown to the attendees by event staffers also outfitted in “Wildcat” wear by BZI. Amid wild flashes by the paparazzi and press, the stars of the film, Zac Efron, Vanessa Hudgens, Ashley Tisdale, Corbin Bleu, Monique Coleman and the director, Kenny Ortega, took to the red carpet before the much anticipated screening of the movie. Beyond Zebra, Inc.’s environmental initiatives were showcased in the September 29, 2008 edition of the Los Angeles Business Journal. The feature article centered on BZI executives, Stacy Burleson and Terri Yamate-Ottengheime, and their accomplishments in the green arena. It also highlighted their efforts to educate businesses in sustainable and ecologically friendly business practices. Beyond Zebra, Inc. president, Terri Yamate-Ottengheime, presented green strategies at the Women’s Business Enterprise Council-West (WBEC-West) forum in Phoenix, AZ on September 25, 2008. The forum, “Green is the New Pink”, offered woman-owned businesses real life strategies on how to create a more sustainable business and life. Terri was joined by Michele Johnson of Artemis Consulting Group, Inc., an environmental consulting firm, who provided the business case for greening businesses as well as valuable tips for saving energy, water, money, and reducing waste. “Green is the New Pink” educational forums will be held in two locations in California, as well as other states throughout the west coast in first quarter 2009. Beyond Zebra, Inc. went behind the scenes and scored big when ESPN enlisted their assistance in greening the 2008 ESPY Awards. In order to emphasize the environmental message of the event, BZI produced 100% EcoSpun (post-consumer recycled soda bottles) lanyards, biodegradable sport bottles and sustainable bamboo/charcoal apparel for the staff and talent. BZI also provided bicycle shirts which were worn by the event party bartenders as they blended drinks via bike pedaling power. Also featured on Ecorazzi (The Latest in Green Gossip). BZI CFO, Stacy Burleson is named the California Chair for the WBEC-West Board of Directors. Stacy brings her administrative experience as 2007 WBEC-West California Co-chair and her position as Secretary of the Santa Clarita Little People Board of Directors to this year’s Board. woman-owned business, but on their civic and community involvement, performance, service levels and their advancement of women’s issues in the business world. BZI executives, Stacy Burleson and Terri Yamate-Ottengheime, were both included in the magazine’s 2007 list of 100 WBEs impacting supplier diversity. This distinguished list highlights key women executives and their companies who influence diversity practices in corporate America. Terri Yamate-Ottengheime was nominated for this award in recognition of her active involvement in furthering the ideals of the Women’s Business Enterprise Council and for promoting the advancement of women in business. BZI was recognized for outstanding services, products and customer care in addition to bringing diversity to the business world. BZI shared the spotlight with local woman business owner luminaries at the Los Angeles Business Journal’s annual “Women Making a Difference” award luncheon. “Change - Financing Strategies for Growth” article discusses BZI’s growth and the financial strategies they investigated to secure working capitol for each step of their development. BZI President, Terri Yamate-Ottengheime is named a member of the governing group of the WBENC marketing committee and task force. BZI establishes the first ever, annual scholarship for the Anne Douglas Center, which provides opportunities for education and job training to women who are in the process of rebuilding their lives. Graduates of the Anne Douglas Rehabilitation Program have access to this fund as they continue their journey toward independence.